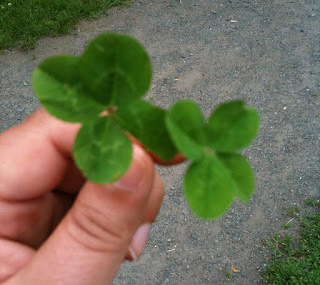 Pete has an unusual talent for finding four-leaf clovers. His mom has a picture frame filled with pressed clovers that he collected as a child. 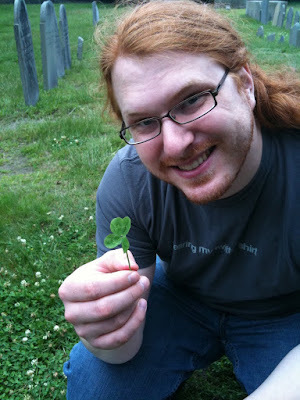 Whenever he accompanies me to graveyards, he scans patches of clover and, more often than not, finds one. Maybe there's something about his engineer's brain that can easily recognize patterns in the chaos — he will occasionally spot a four-leaf clover and then ask me to find it, which I never can. Happy anniversary, Caitlin and Pete! That was such a great party - you should do it again! I miss you both.